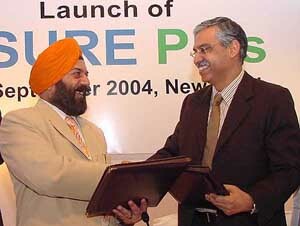 Making a dent in the $ 7.5-billion market for contract research, Chandigarh-based pharmaceutical company, Ind-Swift Laboratories, has entered into contract research agreements worth over $ 3-5 million with two leading European pharmaceutical companies for molecules with a market size of over $ 8 billion to be completed in 18 months. India’s third largest car maker Tata Motors today rolled out its much-awaited station wagon — Indigo Marina — and said it would also tap opportunities for its new vehicle in the European markets, besides selling 4,000 to 6,000 units annually at home. Punjab National Bank (PNB) is likely to bring in December its second public issue of face value of Rs 50 crore, for which the bank will soon approach the RBI and Sebi, said Mr S.S. Kohli, CMD of the bank. The Hero Group, a $ 2.2-billion business conglomerate with a presence in bicycles, auto components, IT-enabled services, and education and training, has announced a strategic tie-up with the National Insurance Company. Union Minister of IT and Communications Dayanidhi Maran today clarified that there was no difference of opinion between him and Finance Minister P. Chidambaram on the issue of FDI in telecom and added the latter is the final authority on the issue. The Reserve Bank of India has given its nod to the Jammu and Kashmir Bank for increasing investment limit for Foreign Institutional Investors (FIIs) to 33 per cent of the banks paid-up equity share capital. The government has announced its intention to encourage farmers and industry to adopt contract farming in the cotton sector to enhance productivity and for the modernisation of the sector. The Government today said export assistance given to the textiles and steel sectors under the Duty Entitlement Pass Book Scheme (DEPB) will be reduced in line with cut in customs duties for these sectors. Fashion guru under the spell of filmy bhoot! Talking to TNS, Mr V. K. Mehta, Joint Managing Director, Ind-Swift Labs, said that as part of its expansion plans, the company was focussing on contract research and manufacturing services (Crams), besides research and development in a big way and hopes to generate 40-45 per cent of its bottomline from here in the next two or three years. The company will be investing around Rs 125 crore over three years on its expansion activities. Mr Mehta said the company had already started the process of upgradation of its R and D facilities and capacity expansion. This includes an investment of Rs 75 crore on up an R and D centre that is being set up at Mohali. They would recruit 150 scientists to focus on drug discovery and contract research. The company will also be investing Rs 35 crore for upgrading and expanding its manufacturing facilities. It will enable the company get more business for contract research from the multinational companies, besides other generic opportunities post-patent era. To enter the regulated markets like the USA, EU, Australia, and New Zealand, the company is focusing on getting its manufacturing plant approved by regulatory agencies like USFDA, TGA and MCA. The company expects the USFDA inspection and approvals by the year end, he said. Ind-Swift laboratories Limited ( ISLL), is one of the largest manufacturers of active pharmaceutical intermediates, bulk drugs and intermediates, with core competence in organic synthetic chemistry and contract manufacturing in the domestic and international market. Over the past few years, ISLL has shifted its focus to complex molecules and development on non-infringing processes to minimise the risk of competition and commoditisation. The three petrol variants of Marina carry a price tag ranging from Rs 4.24 lakh to Rs 4.84 lakh while two diesel versions are priced between Rs 4.8 lakh and Rs 5.19 lakh. The 1400cc Marina will compete with the Baleno Altura from Maruti, the Corsa Swing from General Motors and the Siena Weekend from Fiat. All three estates are priced at over Rs 6 lakh. With the Indigo Marina to be positioned as an everyday-use vehicle, Tata Motors hopes to mainstream the estate segment, which has not had a very sizzling track record in India and has in fact suffered from less-than-lukewarm sales. “We are expecting to sell between 4,000-6,000 units of the estate every year. The target is relatively modest given the fact that most of the competitors have either withdrawn their estate models or managed to sell only 250 units a month at peak sales,” Tata Motors Executive Director V. Sumantran told reporters at the launch of Marina here. This is the company’s second coming into the estate/station wagon segment. 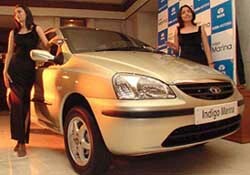 The Tata Estate, launched in 1992, was phased out after few years. Pointing out that estate models are in demand in the European markets, Mr Sumantran said the company plans to eventually tap these markets. The Board of Directors of the bank has already approved the issue that will bring the government’s holding from 80 per cent to 69 per cent. The bank will now seek an approval from the RBI and the government for the issue after which it will go to Sebi for nod, said Mr Kohli on the sidelines of the launch of Internet banking by the bank here last night. The issue is likely to hit the markets in December, he added. The issue comprising 5 crore shares will raise money through the book building route. The bank is already a listed entity with its share quoting at Rs 265.6 down Re 0.56 on the NSE. Under the tie-up, Nsure Plus, a fresh business venture by the public sector insurance company, will offer and distribute automobile insurance packages to customers of Hero Honda. The customers will have the benefits of immediate insurance and delivery of non-life insurance policy at any Hero Honda dealer outlet in the country. The initiative is looking at generating revenues to the tune of approximately Rs 70 crore by the end of this fiscal and approximately Rs 150 crore by the end of 2005-06. To begin with, 44 dealerships of Hero Honda have rolled out these facilities in North India, which is all set to increase to 400 dealerships across the country by June 2005, Managing Director of Hero Corporate Services Sunil Kant Munjal told newspersons. He also said the government would appoint advisors for “synergising the operations” of BSNL and MTNL. Differences have cropped up between the Civil Aviation Ministry and the Finance Ministry over the latter’s proposal of allowing foreign direct investment (FDI) in domestic airlines. According to sources here, the Civil Aviation Ministry is opposed to the move as it will give the foreign airlines a chance to pick up stake in the Indian aviation sector and allow them a footprint on the Indian skies. The ministry believes that there is enough expertise within the country, both in the private and public sectors, to run the airlines in a professional manner. The ministry is expected put forward its objections to the Finance Ministry soon. The Finance Ministry is understood to have favoured allowing foreign airlines to invest in the Indian domestic aviation sector through the automatic route. “We are looking at possibilities to synergise the operations of BSNL and MTNL and as a part of that process we are looking out for some good merchant bankers who could suggest us in this process. Synergies will do good for MTNL and BSNL as both are strong companies,” Mr Maran said. The Minister, however, gave a cryptic answer on whether this was a precursor to a merger of the two entities. “You are free to interpret whatever you want to. You try to explain whichever way you want,” he said. “The Finance Minister has made it very clear about the 74 per cent FDI in telecom. In case of FDI, the FM is the final authority. We have to abide by whatever he says,” Mr Maran said. On the FDI issue he said that there was no difference of opinion between him and the Finance Minister. “The Finance Minister and I are part of the same government and same state too. We do not differ. He makes a statement and I have to follow it. It is that clear,” he told newspersons. Mr Maran exuded hope that the Finance Minister would be able to explain the issue of raising the FDI ceiling from 49 per cent to 74 to the Left parties. “I think the FM will explain it to them if the need arises. But I do not think so. You have to wait for the FM to make the announcement,” he said. Mr Maran, who made a detailed presentation on the issue to the Prime Minister yesterday, did not respond to reports that the hike in FDI ceiling will be brought about in phases. Currently, FIls hold 21.84 per cent of this capital and were not allowed to increase investments in view of the cap. The increased investment limit for FIls is expected to increase the bank’s weightage in the international market and will boost investments, the bank said in a statement here. The shareholders had already passed a resolution for increase in the FII limit at an extraordinary general meeting in Srinagar on July 24. We need to make collective efforts to help farmers grow more good quality cotton at reduced prices, he said. Advocating contract farming as a solution to tide over the miserable condition of cotton farmers in the country, Mr Vaghela said integrated cotton cultivation, known as contract farming initiated by the Cotton Corporation of India, was a welcome sign. He also called upon the ginning factory owners to take steps towards popularising contract farming in their areas. Highlighting the steps being taken by the government, the minister said the opening of Farmers’ Information Centre would help the farmers get more information about the latest technological advancement. “Improvement in productivity and reduction in the cost of cultivation through measures implemented by mini missions part one and two will make cotton growing more remunerative for the farmers,” the minister said. He lamented that there were several weaknesses in the cotton textile sector and the cotton grown in the country suffered from low productivity and poor quality. Mr Vaghela hoped that the steps taken by the government would reduce expenditure on pesticides, reduce trash and contamination levels in cotton and render indigenous cotton to the textile industry. He urged the Agricultural Ministry to speed up the first and second phases of the Technology Mission on Cotton (TMC). "Since the customs duty has gone down, the DEPB rates also have to go down. They are being worked out and will be announced within a day or two," Commerce Minister Kamal Nath said here. As the import tariffs in the textile sector were brought down to zero in the budget, adjustment has to be made in the DEPB rates, he said on the sidelines of a function. Exporters will get the DEPB benefit minus the tariff concessions granted in the Union Budget, he added.